Defence IQ's Richard de Silva speaks with key speakers at this year’s Airborne ISR & C2 Battle Management delegation, who share insights on the challenges facing NATO ISR. 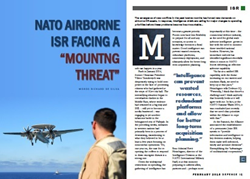 NATO ISR facing a "mounting threat"
Much can happen in a year. Back in January 2014, former Ukrainian President Viktor Yanukovych was desperately trying to hold onto power in the face of protesting citizens who had gathered at the steps of Kiev city hall. The intensifying situation began to overshadow clashes in the Middle East, where violence had returned in a big way and ISIL – still yet to become a media buzzword – was engaging in yet another infamous battle in the beleaguered city of Fallujah. In the preceding weeks, militaries in western nations had primarily been in a process of downsizing, transitioning to what they believed to be at least a few years focusing on noncombat operations. Yet, one year on, the case for re-opening the coffers to respond to these emergent threats is a strong one. They shared insights on the how the emergence of new conflicts in the past twelve months has forced new demands on airborne ISR assets and how intelligence chiefs are now calling for major changes to spending priorities before these problems become insurmountable. The complete report available for free download here. Defence IQ is a leading news and analysis portal on global defence and military-related topics. Join the 70,000-strong community now for access to articles, videos, podcasts and sector reports: http://www.defenceiq.com/join.cfm.